At it’s core, this mod adds an iron trapdoor and new metal rods into the game. 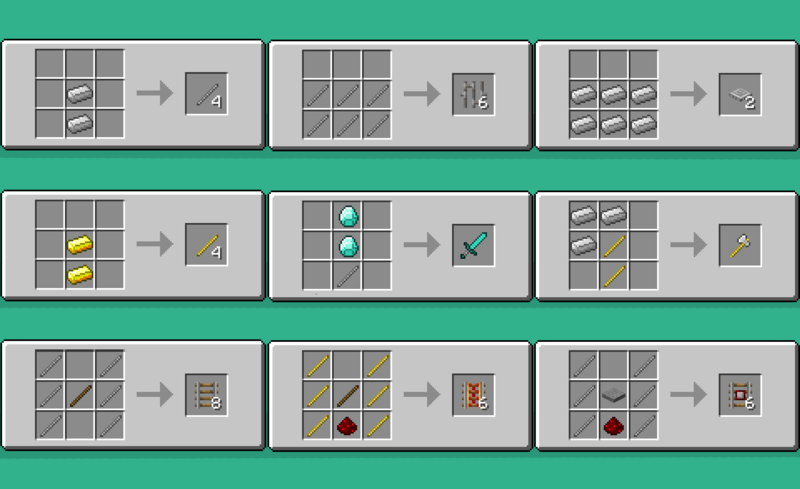 Iron rods (created by placing two ingots vertically in the crafting grid) are used in place of ingots in the iron bar crafting recipe, which is now used by iron trapdoors (that were, as an interesting side-note, already coded into the game!). There are a few extra options on top of this, however. Iron rods can also be used to craft reinforced, more durable versions of the standard tool-sets (+ bows). Gold rods (crafted in the same way) can be used to create enhanced, more enchant-able tools. Finally, the mod adds the option to replace or supplement the vanilla rail recipes with new rod-based alternatives. You can pick and choose whichever features you’d like in the mod’s config file – though all are enabled by default. Make sure your META-INF is deleted.